The Fast Finger keyboard was made for people, mainly children, who are not yet comfortable with the QWERTY layout of most keyboards. 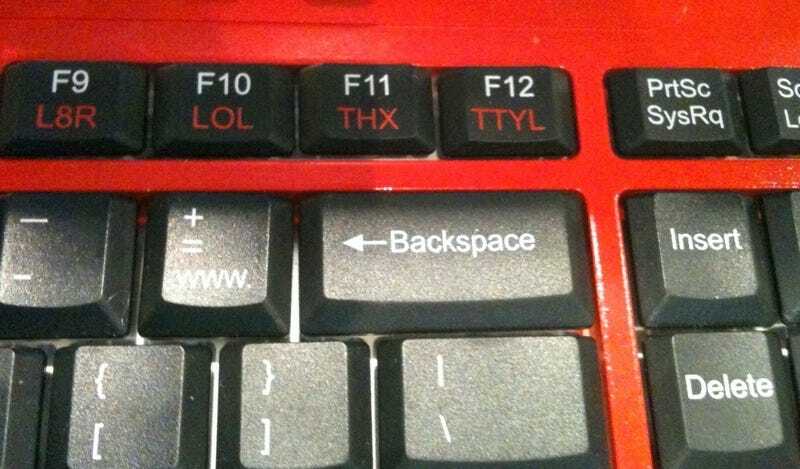 It's also made for people who'd love to use just one button to type TTYL, L8R or BRB. I saw this keyboard at Toy Fair 2010 in New York City yesterday in one of the aisles that had educational games for kids. The keys on the Fast Finger keyboard are laid out in alphabetical order, though a press of one button can rewire those keys to work in the standard QWERTY order instead. As you can see, it's simply a matter of the keys functioning based on the white characters printed on them or the red ones. But look at the function keys at the top and you will see that with this keyboard you will no longer need to waste energy making four finger-taps to type ASAP. Nope. Just activate the red-letter functionality and you'll be typing ASAP with the single press of the button formerly known as F1. Type F4 and... CYA! Here's a dramatic video pan of the keyboard. Apologies for the misspeak at the end. Turns out that the Fast Finger keyboard can be obtained through Amazon, but for a shade over $20, not a shade under. More details at the official Fast Finger Keyboard website.